It’s the last comics haul of 2010! And… it’s the last entry in this series I’m going to do. I’ve been writing this column almost-weekly for over four years, and my enthusiasm for it has flagged over the past year. I’ve decided it’s time to turn my attention to other things and not worry about getting in a column each week. I hope those of you who have followed my ramblings have enjoyed them. I do plan to write about comics from time to time, but probably in a different format. 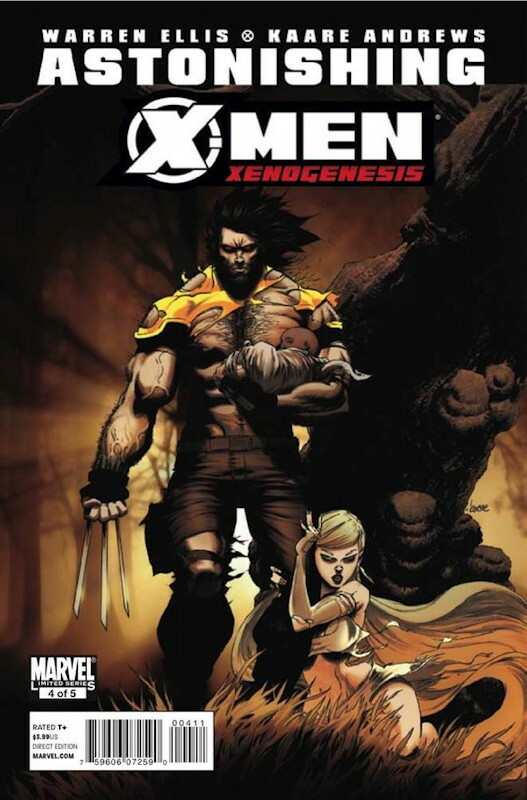 I’ve been reviewing each issue of Astonishing X-Men: Xenogenesis mainly because Kaare Andrews’ covers have been so awful – comically so, really. But this cover is not bad, even if it is another take on the old “warrior with babe hanging onto his leg” image. Warren Ellis’ story is gelling into a new reworking of Alan Moore’s great Captain Britain storyline involving Jim Jaspers, a mutant who can bend reality, the Furies, unbeatable killing machines, and Warpies, mutant-like babies with destructive powers. 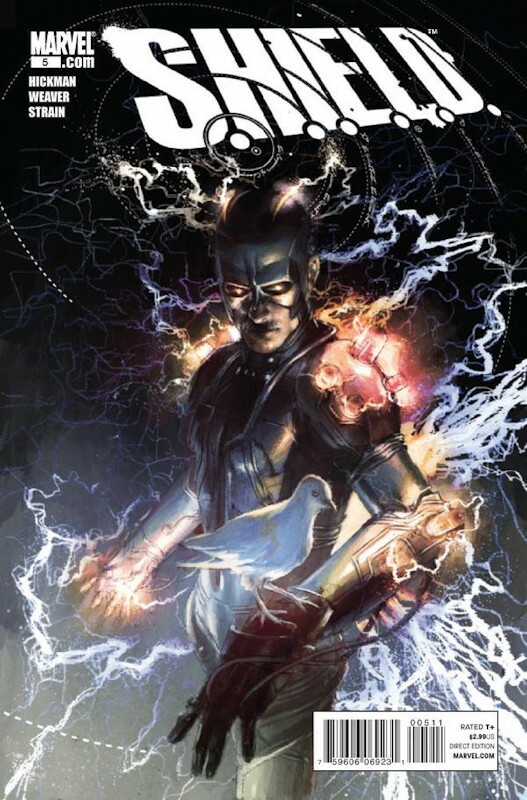 Other than tying into his invention of universe-hopping Ghost Boxes, Ellis hasn’t really done much very new with the pieces; an army of Furies is even more unbeatable than the original one was, and it’s kind of amazing that none of the X-Men have been outright killed as yet. And it’s hard to see exactly how the story’s going to wrap up in just one more issues. Ellis’ Astonishing X-Men run has been fairly interesting, and it feels like it’s gradually building towards something, but it’s been very frustrating that it’s been so plagued by delays. I don’t know if it’s Ellis’ scripts running behind, or the musical chairs among the artists, or that all of the artists have fallen behind, or if editorial is just asleep at the switch (or doesn’t care), but this run really needed to stay on a decent schedule to work. Long delays are a good recipe for fan apathy, and it’s hard for me to work up much enthusiasm for what Ellis is doing here anymore. Strangely, this month’s Captain America is “The Trial of Captain America” part three, and yet the cover (at left) says “It begins!” Huh? The cover is accurate, since the actual trial starts in this issue. 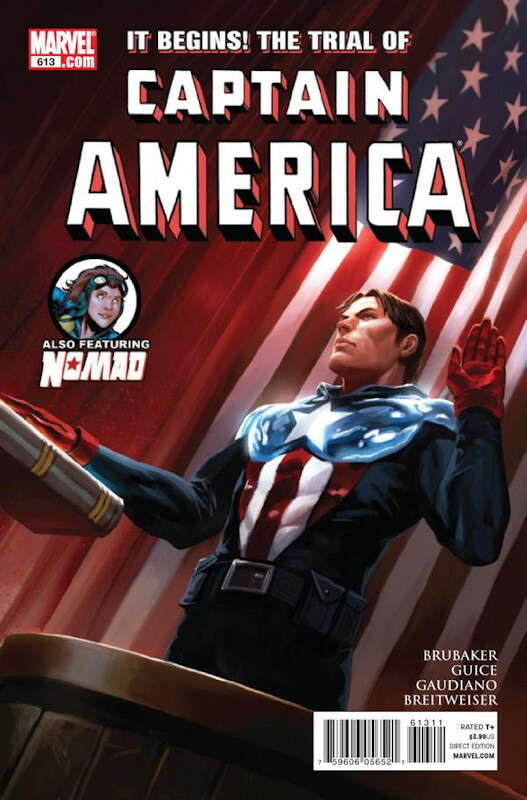 All things considered, I think Steve Rogers is more interesting as Cap than Bucky is, but I’m not sure where Bucky really fits in in the modern Marvel universe otherwise. No doubt Steve will take up the mantle again eventually, though. Jonathan Hickman’s S.H.I.E.L.D. has been getting good word-of-mouth, but I’ve found it pretty tedious. It’s a combination shadow history/conspiracy book: S.H.I.E.L.D. has been around for thousands of years protecting the world against amazing threats (like Galactus). In the 1950s, a young man named Leonid is being inducted, but his father, the Night Machine, tries to stop it. He in turn is stopped by Howard Stark and Nathaniel Richards, and the three disappear. Leonid then learns that he’s in the middle of a power struggle between S.H.I.E.L.D. leaders Sir Isaac Newton and Leonardo Da Vinci, both of whom (along with Nostradamus) seem to be immortal. Aside from feeling that another “everything you know is wrong” story set in the Marvel Universe seems like overkill, the presence of all these real-life figures, still living centuries after their supposed deaths, seems basically ridiculous. Basically the series hasn’t sold me on any of its core elements, and the story itself has been pretty ponderous. 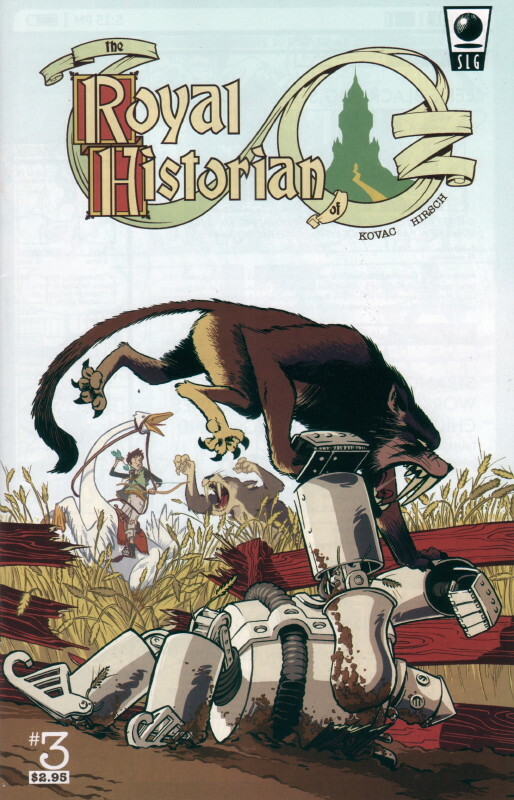 I picked up the first two issues of The Royal Historian of Oz at the SLG booth at APE in the fall. Although I’m hardly an Oz fanatic, I enjoyed the Baum books when I was a kid, and I’ve enjoyed some of the spin-off titles that have been published in the last 20 years. (Indeed, I think they’re a strong argument for letting creations fall into the public domain once their creators die.) I think my favorite was Oz Squad, which started as a dark take on the series (Tik Tok comes to Earth and his morality spring runs down, causing him to become a psychopath, and the “original four” Oz characters have to take him down and bring him back), but toned down the darkness in later issues in an entertaining time travel story. Royal Historian takes place in a dystopian future in which Jasper Fizzle writes new Oz stories (despite having no talent), and is branded an outlaw by the keepers of Oz lore. But then Jasper finds a way to get to Oz itself, and brings back some of its wonders to put on display. His son, Frank, is the book’s hero, having been embarrassed by his father’s obsession, but then amazed at what Frank brings back from Oz. However Frank is then captured by Ozma and her citizens to be held hostage until Jasper returns the items he’s stolen. This issue focuses on Frank’s reactions to actually being in Oz, and takes the interesting approach of overwhelming him with characters in very short order – also overwhelming me, the reader, as I don’t remember half the characters who show up here. Jellia Jamb I kind of remember, but Button-Bright? The Glass Cat? At first I found it too much to take in, but then I figured that was kind of the point: Given Oz’s substantial backstory and large cast, a real person being thrown into it might be similarly overwhelmed. Kind of clever, if that’s what writer Tommy Kovac intended. After a mishap in the castle, Frank is sent with the Tin Woodsman to live in the countryside, where he gets a more measured exposure to some of the wonders of Oz. The story has been a little slow so far, but it’s getting more entertaining now that we’re in Oz and not on the dreary Earth that Kovacs and artist Andy Hirsch have come up with. Hirsch has a cartoony style (somewhat similar to that of Rob Guillory on Chew), but his panels are pretty complex. It’s always interesting to see how different artists take on the Oz characters, and Hirsch makes the Scarecrow look kind of creepy, while the Woodsman is downright inhuman, albeit likable in his way. I think the biggest drawback to the book is that few characters in it are likable: Jasper is a talentless obsessive, and now a thief. Frank is a bit of a blank slate, largely defined by his frustrating with his father. Most of the Oz characters shown in this issue seem mentally unbalanced at best, and as creepy as the Scarecrow in many ways. The book really needs Frank to become better-defined and his own man. Otherwise it’s hard to find someone to root for, or a cause I can believe they’d get behind. If the creators keep publishing (always a risky proposition for small-press comics) and can work out some of these issues, then this could be a lot of fun. But it’s not there yet. That’s all for this year! Thanks for reading!